Steven Gerrard's brace helped Liverpool to a hard-fought win at Marseille in their Champions League Group D opener. Lorik Cana beat the Reds offside trap to slot the French side ahead but Gerrard curled in a sublime outswinging 22-yard shot to level. 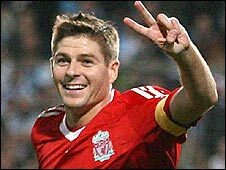 Gerrard scored his 99th goal for Liverpool when he slotted in a retaken penalty after Ryan Babel was fouled. Mamadou Niang glanced a header wide and had a strike saved by Pepe Reina late on but the Reds held on for a win. Liverpool had beaten Marseille 4-0 last December but found the current side a much-improved unit and hungry to avenge that defeat. Marseille gave the Reds a stern test but found Liverpool's defence - in particular Reina - in stubborn mood, while Gerrard again rose to the occasion. The midfielder was starting for the first time since recovering from a groin injury along with striker Fernando Torres, who had an early looping far-post header tipped over by Marseille keeper Steve Mandanda. The home side did not let that affect their attacking intentions and Bakari Kone's pace was unsettling Liverpool, while Marseille's quick one-twos were threatening to pierce the Reds backline. Marseille's quick one-twos were threatening to pierce through the Reds backline and they almost succeeded when Niang was played through on goal, but he blazed high from a tight angle when he might have been better squaring the ball. The Reds hit back as Babel beautifully turned his marker but could not produce a finish to match as he fired over. Gerrard forced Mandanda into a smart save with a low 22-yard shot before Torres headed a difficult bouncing ball over at the far post. Marseille's positive approach made for an open and entertaining game and they went up the other end to take the lead. Benoit Cheyrou - the brother of former Liverpool midfielder Bruno - unhinged the Reds offside trap by quickly controlling and playing Cana through on goal to slot home. But Liverpool's skipper delightfully shot into the far side of the goal to equalise. Ronald Zubar brought down Babel to concede a spot-kick and Gerrard confidently side-footed in at the second time of asking after Torres encroached into the area during his first attempt. Liverpool tightened up defensively after the break and Vitorino Hilton had a header saved and Karim Ziani shot over as Marseille threatened. The French side left themselves open to the counter-attack as they pushed forward and Babel almost took advantage. A low Albert Riera cross fell to him six yards out and he blasted a shot that was saved at point-blank range by Mandanda. Liverpool appeared to be feeling the effects of their tireless efforts in beating Manchester United last Saturday and survived two late Marseille chances. Niang headed wide in the 89th minute before seeing a powerful angled shot saved by the leg of Reina shortly before the final whistle. "Gerrard's first goal was amazing. A fantastic goal. "We played on the counter-attack and it could have been better but three points is a massive result for us. "They have a good mentality. We knew it could be difficult and it was. The team as a whole was very good in defence." "Gerrard is a world-class player and he proved that. Only players of that quality can score goals like that. "We had just scored and we should have been focused on protecting that advantage. But players of Gerrard's quality are capable of scoring goals like that and he changed the course of the match. "I am very disappointed with the result. We created enough chances to have won. I am angry with the outcome because we were unable to make use of our good play and the opportunities we created." Marseille: Mandanda, Bonnart, Zubar, Hilton, Taiwo, Cana, Cheyrou, Kone (Samassa 75), M'Bami (Valbuena 41), Ben Arfa (Ziani 57), Niang. Subs Not Used: Riou, Zenden, Kabore, Erbate. Liverpool: Reina, Arbeloa, Skrtel, Carragher, Dossena, Gerrard (Benayoun 69), Mascherano, Leiva Lucas, Kuyt (Keane 86), Torres (Riera 64), Babel. Subs Not Used: Cavalieri, Agger, Alonso, Degen. Goals: Gerrard 26, 32 pen. BBC Sport Player Rater man of the match: Steven Gerrard on 8.78 (on 90 minutes).